Sometimes all you need is just a little something on your shoulders and upper arms to take the chill off when working at the computer. Or maybe that sundress is too chilly after dark. 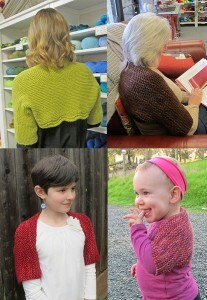 This must be the easiest shrug ever, complete beginners can knit it easily! A garter stitch rectangle knitted very loosely, it has amazing stretch in all directions. It was inspired by one I saw Claire wearing on the series Outlander on the Starz channel. For women, children and babies. Download the Free Shrug pattern here.